Sugarloaf Mountain is the largest ski area east of the Rockies. The resort lies in the Carrabassett Valley, in the middle of Maine’s Western Mountains, just a four-hour drive from both Boston and Montreal. The elevation at Sugarloaf Resort Village is 1,417 feet. Sugarloaf sees an average of 200 inches of snowfall per year. The resort boasts a ski season longer than that of Breckenridge, as skiing is in season from mid-November to early May. Sugarloaf Mountain’s summit, the second highest in Maine, is 4,237-feet-tall and reachable by the Timberline Quad lift, one of 13 lifts at the resort. At the peak, neighboring states of Vermont and New Hampshire, Canada, and Mount Katahdin (Maine’s tallest mountain, at 5,267 feet) are all visible. Sugarloaf is the only resort in the Northeast that offers lift-service to above treeline skiing. The resort’s 1,240 developed, skiable acres are home to more than 160 trails of varying difficulty, which stretch 60 miles. Sugarloaf offers adaptive ski programs and lessons for those who require special equipment. Sugarloaf is also home to the state’s most expansive Nordic skiing trails. The rest of the Carrabassett Valley is pretty quiet, so you won’t feel like you’re missing out by spending all your time at the resort. There are plenty of on-site accommodations, restaurants and entertainment options after dark. Both Sugarloaf and its sister resort, Sunday River Ski Resort in Newry, are operated by Boyne Resorts, which runs ten other ski resorts in the United States, including one other in New England. In the off-season, Sugarloaf is also home to the top-ranked golf course in Maine. 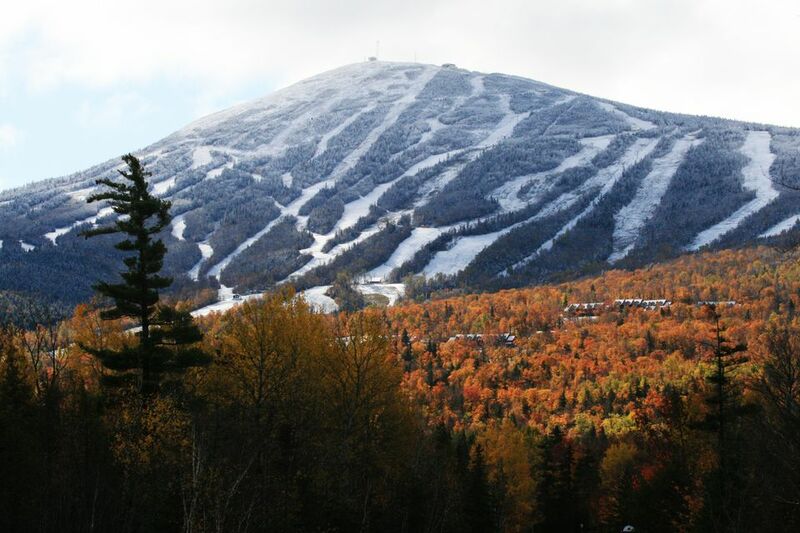 Sugarloaf has 1,240 skiable acres; 2,820-foot vertical drop (the most continuous in New England); 23% beginner; 34% intermediate; 43% expert/advanced. Sugarloaf Ski Resort has terrain for all levels of skiers, though the majority of the 162 trails and glades are rated as black diamond or double black diamond. Note: There are also 56 miles of trails for Nordic skiers, see details further below. Advanced: Served by the King Pine Quad and Skyline lifts, the natural snow bowl of King Pine Bowl is home to Widowmaker and Flume, two trails loved by the U.S. Ski Team, as well as half-groomed, half-bumped Haulback, and the all-natural Ripsaw. Other advanced parks include Haywire, Central Mountain, and Brackett Basin. The latter has steeps, chutes, and cliffs that only true experts should attempt in groups. Intermediate: Trails for in-between skiers are available on Whiffletree with just a six-minute lift ride. Intermediate cruising trails on West Mountain include Scoot, Windrow, Glancer, and Horseshoe. Beginner: For those just learning about pizza and french fries, the Birches and Landing area is gently-sloped so you can build confidence before taking on official trails. Find the Skybound beginner’s park on Whiffletree or work your way up to a little more pitch on Double Runner with trails like Lower Winter’s Way, Boardwalk, and Lower Narrow Gauge. At Sugarloaf, online lift tickets are less expensive than those purchased on arrival and vary based on demand as hotel and airline bookings do. Purchase tickets well in advance for better prices. If you buy multi-day tickets, the price per day is lower. Half-day tickets are available for a small discount. Discounts are also available for Maine residents, military, some corporations, and to college students during College Snowfest Week. If you’re a beginner, significantly cheaper lift-tickets are available that only work for certain runs. See their website for current rates and to purchase tickets in advance. 45 North: Frequent this rustic restaurant at the Sugarloaf Mountain Hotel for fresh, local, ingredients alongside creative cocktails and local brews. Open for breakfast and dinner only. The Shipyard Brewhaus: Watch the game while relaxing by the fire and dining on traditional Maine seafood with a twist in this casual pub in the Sugarloaf Inn. The Widowmaker Lounge: For late nights, live entertainment, 16 beers on tap, and a small bar menu visit this lounge atop the Sugarloaf Base Lodge. Bullwinkle’s Bistro: On top of the mountain at Windrow Trail, you’ll find an American-style menu with plenty to help warm you up in between runs. The Bull Moose Cafe: For homemade soups, sandwiches, cookies, and other baked goods beside a roaring fire and stunning mountain views, visit this cafe at the Sugarloaf Outdoor Center Lodge. Food Truck Alley: Outside on the Beach, a variety of Maine’s best food trucks come in and out for quick bites during the winter season. Sugarloaf Sports & Fitness Center: If you need a pick-me-up after a workout, you can find breakfast sandwiches, coffee, pizza, wraps, salads, snacks, soup, beer, and wine in-house at the fitness center. SugarBowl Bowling Alley: For casual dining and beer in a family-friendly atmosphere, visit SugarBowl, a few minutes drive off the mountain. Sugarloaf’s rental shop is on the third level of the Base Lodge and is open from 8 a.m. to 5 p.m. during the winter season. Experts will ensure you’re using the right sized equipment and that you feel comfortable with your gear. Rentals of skis, skates, and snowshoes can also be made at the Lodge at the Sugarloaf Outdoor Center. If you’re in the position to purchase your gear, visit the Downhill Supply Company, the Burton Signature Store, the KÜHL Signature Store, The Sugarloaf Shop and Sports Outlet, or the Lodge at the Sugarloaf Outdoor Center. A variety of lessons and clinics for different skillsets is available at Sugarloaf, including private, private group, and group classes. Clinics include a six-week snowboarding course, a three-day Sidecountry/Alpine Glade Camp, and women-only clinics. Free lessons are offered in-season each weekend to skiers ages 4+ who require adaptive ski, snowboarding, or snowshoeing equipment. Nordic Skiing and Snowshoeing: Aside from alpine skiing trails, Sugarloaf boasts the largest Nordic center in Maine. There are 56 well-marked, patrolled, and scenic miles of trails to explore on either cross-country skis or snowshoes. Access to these trails and equipment rentals from the Sugarloaf Outdoor Center are available with the purchase of a Sugarloaf lift ticket. Ice-Skating: Also included with a lift ticket from mid-December to mid-March is access to the NHL-sized ice-skating rink and rentals at the Sugarloaf Outdoor Center. Pick-up hockey games are played on Tuesday and Thursday nights if conditions allow it. Sports & Fitness Center: Most ski packages include free access to the Sugarloaf Sports & Fitness Center, which offers a variety of activities. Day passes and seasonal memberships are also available for purchase. To refresh after skiing, there are six hot tubs, two saunas, two steam rooms, and massages and spa treatments by appointment for an extra cost. For those who require more of a workout than the slopes, you’ll find a full gym and heated indoor pool. Racquetball and volleyball courts are rented by the hour. Carrabassett Valley Anti-Gravity Complex: This activity complex at the base of Sugarloaf is home to Maine’s largest indoor skate bowl, trampolines, an indoor rock-climbing wall, a multi-purpose gymnasium, a track, and a fully stocked weight room. You can rent out the trampolines and climbing wall for private use and instruction. Skateboarding lessons are available for those under the age of 15. Yoga and Pilates classes are offered. SugarBowl Bowling Alley: Drive a few minutes to SugarBowl for eight lanes of ten-pin bowling, an arcade, a virtual golf simulator, and casual dining. Sugarloaf Family Entertainment Series: Enjoy family-friendly live shows in-season. Ooh and ahh at frequent fireworks shows on the Beach in front of the Base Lodge. Winter Holiday Events: Celebrate the winter holidays at Sugarloaf with Thanksgiving dinner, a fashion show, a gift bazaar, a tree-lighting ceremony, and New Year’s Eve Fireworks. Live Music: Rock out on Saturdays in the Widowmaker Lodge. Past performances include Boston R&B ensemble Miss Fairchild, duo Turner Templeton, Montreal-based rock and blues band The Damn Truth, and folksy duo The Natural High Jumble. These events are typically 21+. Marathon: Sugarloaf’s Marathon and 15k typically take place in May. Sugarloaf offers accommodation options for many different budgets. Each property at Sugarloaf Ski Resort is walkable to the slopes and to many on-site restaurants. Sugarloaf Mountain Hotel: This resort hotel is one of the best Maine ski hotels. It will make you feel cozy and warm from the wood-paneling in the on-site restaurant 45 North to the custom-built 30-person hot tub. Suites and adjoining rooms are available. Sugarloaf Inn: For a more casual (and affordable) stay, check into the Sugarloaf Inn, one of the original slopeside accommodations, with rooms for 1-4 guests. Condominiums: Have your pick of hundreds of on-site condominiums ranging in size from studio apartments to five bedrooms or entire homes for more privacy.